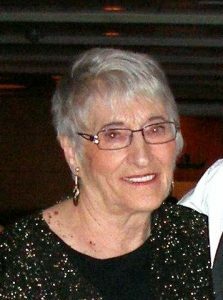 Rose passed away peacefully at the Marjorie Willoughby Snowden Memorial Hospice Home in Kamloops, BC on the afternoon of January 4, 2018. Rose was predeceased by her parents Alfred and Florence Troop, her first husband Frank Rodgers, her second husband Harold Wells, her sisters Bernice Archer (Tom), Irene MacEwan (Arnott), brothers and sisters in-law Ed Ochitwa, Bud Hushagen, Orville and Vivian Erikson, Roy and Murial Rodgers, and Harold’s daughters Helen Meiklejohn and Linda Jamaeff. Rose was born in Burnside, MB, a small community near Portage La Prairie, MB. She was the second of four daughters. Rose was a “country” girl, moving to and being raised in Quill Lake, SK. She played softball and ran track and field in the summer and ice skated in the winter. In 1940 she met the first love of her life, Frank Rodgers. In 1942 Rose travelled from Saskatchewan to Truro, NS by train to marry Frank who was stationed with the Postal Division of the Canadian Armed Forces. On August 29, 1942 they were married. After the war, Rose and Frank moved back to Saskatchewan where Logan was born on Feb 9, 1950. The family moved to Maymont, SK for Frank to work as a grain elevator agent. Rose’s life changed forever on October 17, 1951 when Frank was injured and died in an industrial accident at the elevator. Rose moved to Saskatoon and went to work for the City of Saskatoon. In the mid 1970’s she retired and moved to British Columbia to be with her son and family. In 1982, after a brief courtship, she married long-time family friend and widower Harold Wells and moved back to Saskatoon. This marriage resulted in over 25 years of happiness for both and a very large extended family. Harold passed away on May 31, 2007 at the age of 102. In 2009 Rose again moved to British Columbia to be close to family and relatives. Rose is now at rest awaiting fulfillment of her life-long beliefs as one of Jehovah’s Witnesses. There will be no service in Kamloops at this time, by request of Rose. She has been cremated and will later rejoin Frank in the Rodgers family plot in Quill Lake, SK. Any memorial service later in Saskatchewan this spring or summer will be posted. Dear Nicole. Trever. Ella and Calli. Hard times and wonderful memories ahead. God Bless. I know you thought highly of her.Edith and Barry McLeod.